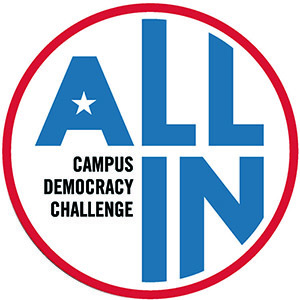 This summer, Indiana University Bloomington - through the spearheading efforts of its own Political and Civic Engagement Program (PACE)- signed up to join the ALL IN Campus Democracy Challenge. The challenge extends nationwide to over 100 college campuses and universities, all committed to improving democratic engagement, increasing student voter participation rates, and graduating students with a lifelong commitment to being informed and active citizens. It is a nationwide competition that awards bronze, silver, gold, platinum and other award levels to recognize college campuses that meet specific student voter participation rates. As part of the ALL IN Challenge, IUB is integrating Walk 2 Vote (W2V) in its plan. W2V is a civic engagement initiative that offers a model as a guide to walk students and faculty through the process of planning their own civic engagement program on campus. The model was originally designed and successfully implemented by students at the University of Houston - Downtown and is now scaling up as a national movement. IUB is utilizing this as a model to host an event that facilitates students “walking to the polls” for early voting. IUB is adding its own unique twist of proposing a series of “Walking Wednesdays” during the period of early voting. This exciting project is gaining support campus-wide. PACE undergraduate students will be engaged in supporting efforts for voter registration, non-partisan voter education and W2V activities to enhance voter turnout. This project aims to generate a positive regard for voting and the electoral process, in general, while hoping to increase voter participation rates at IUB and win a recognition seal. Listen to "Through the Gates" podcast with Political Science Professor Bernard Fraga and PACE Director Sandra Shapshay.